Though they are often referred to as the same thing, there are actually quite a few differences between a classical guitar and an acoustic guitar. In fact, in some ways they are as different as an acoustic guitar is to an electric guitar – but still these two instruments sometimes get lumped under the same term. So this post will outline the things that make these two instruments quite different. First let’s take a look at the most obvious differences and then we can take a look at some more subtle differences. An acoustic guitar uses steel strings, whereas a classical guitar uses Nylon strings. This is perhaps the most significant difference. There is a big difference in tone and feel between steel strings and nylon strings. These differences are one of the major reasons why each instrument is typically used for different styles of music. There are exceptions to every rule though – you can get guitars that are essentially acoustic guitars that are made for Nylon strings. Often the tonewoods used to build a classical guitar are different to those used on an acoustic guitar. Though, there are crossover tonewoods that are used for both. A lot of these woods are used on both but some are more common on classical (like Cedar) and some more common on acoustic guitars. Typically, classical guitars and acoustic guitars use different methods for attaching the strings to the bridge end of the guitar. Steel strings have “ball-ends” and these are placed inside the bridge. Bridge pins are then used to hold the strings in place. Nylon strings are typically tied to the bridge – though you can get some Nylon strings with ball-ends. Classical guitars typically have 2” (50mm) neck widths and above. Neck width on Acoustic guitars, on the other hand, typically have 1 11/16” (43mm) or 1 ¾” (44mm) neck widths. 12 String Acoustics typically have wider neck widths to accommodate the extra strings and there are other neck widths for acoustic guitars but these are the most common. Acoustic guitars come in a variety of shapes and sizes these days but typically speaking classical guitars are smaller. There are acoustic guitars you can get that are smaller than classical guitars but the average acoustic guitar is bigger than a classical guitar. Classical guitars also have less variation in shape and size. Most classical guitars fit within a certain size and shape – with only subtle variations. Acoustic guitars have a wider range of different shapes and sizes. There are also some less obvious differences between classical guitars and acoustic guitars. Acoustic guitars typically have a truss rod (a steel rod) running through the neck of the guitar. This is needed on acoustic guitars because of the extra tension that steel strings place on the neck. They aren’t needed by classical guitars because Nylon strings produce less tension. On a majority of acoustic guitars, the neck joins the body of the guitar at the 14th fret. There are acoustic guitars that join at the 12th fret and this was traditionally the case. 12-fret acoustic are making somewhat of a renaissance at the moment. On most classical guitars, the neck joins at the 12th fret – there are exceptions to that too – but most join at the 12th fret. The machine heads on classical guitars usually have an open mechanism and the headstock is slotted. 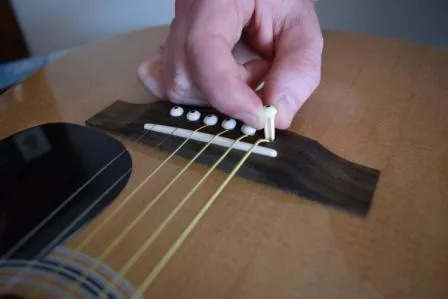 The machine heads on acoustic guitars sometimes have an open mechanism but usually the machinery in hidden and the headstock is usually a solid piece and is seldom slotted. You will find more acoustic guitars with cutaways than you will find classical guitars with cutaways. That said, there are classical guitars with cutaways, but they are less common. 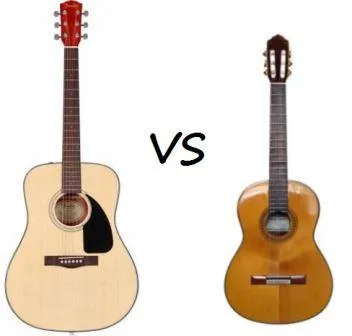 Though the line between these two types of instruments is somewhat more blurred these days with many crossover guitars – and acoustics incorporating things like 12-fret neck joins and some made for Nylon strings – there are still some quite definite differences. There are exceptions to most of the differences above but by and large acoustic guitars and classical guitars are still quite different instruments and typically used for different styles of music.